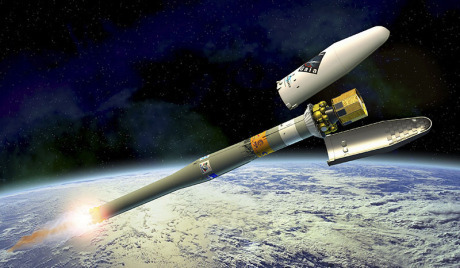 On December 19, 2013 the new satellite of the European Space Agency (ESA) called GAIA (Global Astrometric Interferometer for Astrophysics) lifted off from the launching pad of the European spaceport in Kourou, French Guyana, and set off on a journey of 1.5 million kilometres, on the Russian-European launch vehicle Soyuz. And at this distance from the Earth, the satellite will scan the Milky Way for 5 years, with the scope of charting a 3D map of the Galaxy, making precise measurements of the motion, distance, changes in luminosity and position of over one and a half billion celestial bodies. A census of the stars in our Galaxy will allow us to investigate and to answer some fundamental questions, such as: When were the stars of the Milky Way born? When and how was our Galaxy formed? How big is it and how is its dark matter distributed? 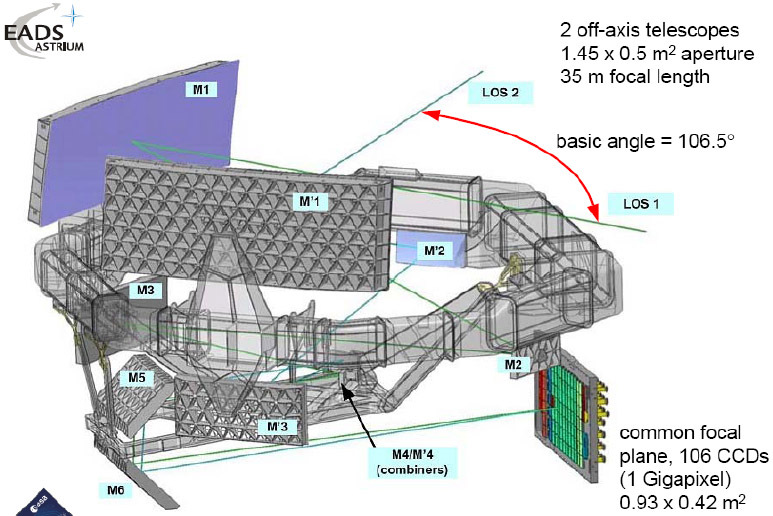 The GAIA satellite was lodged inside the upper stage of the Russian rocket Soyuz. Below this stage, there were four other propulsion stages, each one with a different function. The first stage was used to lift the rocket from the Earth, the second and third brought the satellite to its orbit around the Earth, and the fourth, Fregat MT, enabled the rocket to carry out more complex manoeuvres in order to shift it in different orbits. 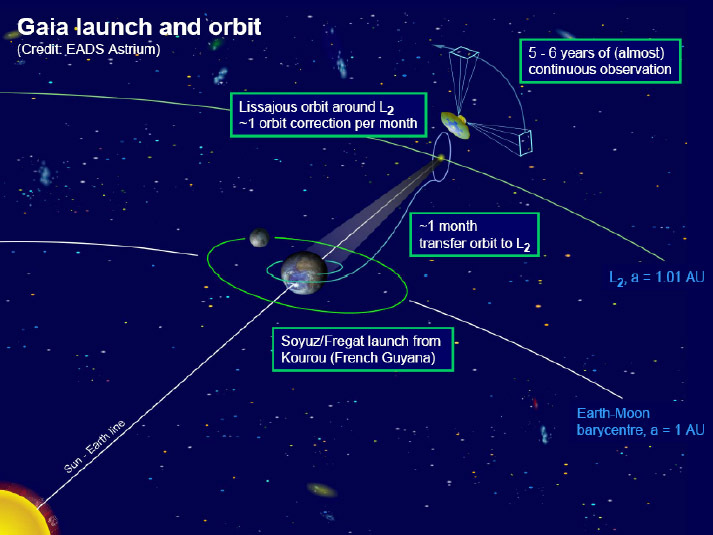 Gaia has travelled for a month in space and now is orbiting around Lagrangian point L2 of the Sun-Earth system, about 1.5 million kilometres from the Earth, in the opposite direction to the Sun. In point L2, gravity and repulsion forces are balanced, in other words substantially there is a condition of equilibrium. This orbit is also particular because there are no eclipses: and this guarantees constant Solar radiation, and therefore excellent thermal stability, high efficiency in observation and, considering the distance from the Sun, low radiation. From this point of balance, Gaia has already begun to send data that will be useful for calibrating the instrumentation. 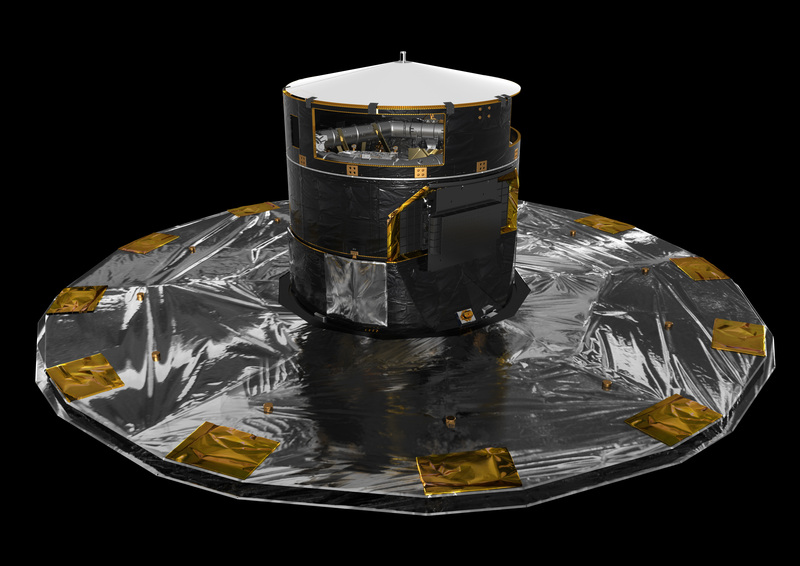 Gaia is a satellite, 3 m long, 10 m wide and weighs almost 2 tons. It is equipped with an exceptional instrument, the largest focal plane CCD mosaic ever developed before for space observation. The instrument consists of two telescopes, for observation along two separate lines of sight, separated by a 106.5° angle. Each telescope has 6 rectangular optical elements; the light coming from the two directions are focussed on a single focal plane by a beam collimator. The satellite can record objects up to magnitude 20 in a visible frequency, i.e. about 1,000,000 times weaker than those which can be observed with the naked eye. Gaia will be able to determine the position of the stars with a precision of 10 millionths of an arcsecond, i.e. it can measure, from the Earth, the size of the nails of a man on the Moon. Furthermore it will measure, with extreme precision, the distances and velocities of celestial objects, which will enable us to obtain accurate measures of their mass, age and luminosity. More specifically, to know the velocity of the stars is significant in order to obtain the path and therefore to determine the structure and the future evolution of the Milky Way. Furthermore, by creating a map of the velocity of the stars, it will be possible to obtain information on the dark component of matter, which, even though not visible, influences the motion of celestial objects gravitationally. 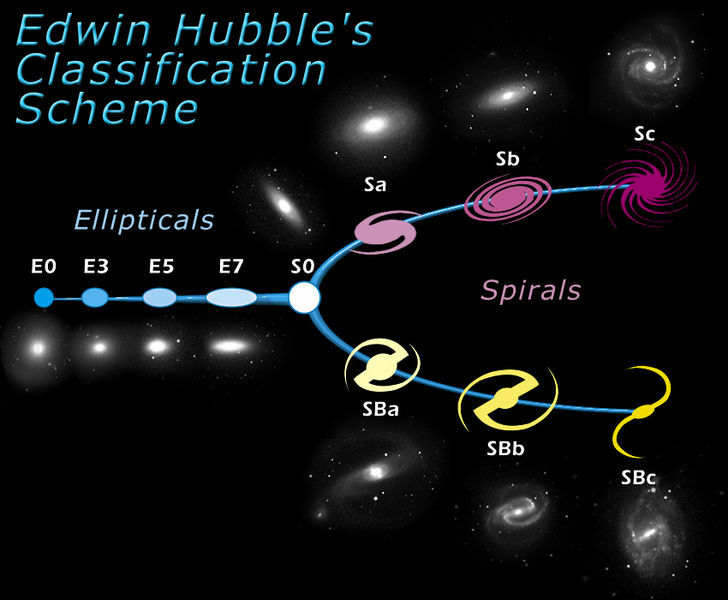 The Milky Way is classified a SBc barred spiral galaxy, i.e. a galaxy made up of a central bar-shaped structure from which spiral arms spread. It belongs to the Local Group, a group of about 35 galaxies, and our Galaxy and the Andromeda Galaxy are the more important objects of the group. Its mass is about 2*1011 solar masses. However, if we also consider the dark matter that cannot be observed directly, the mass reaches 1012 solar masses. The diameter is approximately 100,000 light years. It is possible to distinguish the following parts: the bulge of the galactic centre or nucleus; the galactic thin disc whose thickness increases moving further from the centre, and fades in the arms; the thick disk surrounding the thin disk and the spheroidal halo wrapped around the galaxy. The Sun and the Solar System are in the thin disk, (more precisely in the Orion arm) at a distance of about 30 light years from the centre. With regard to the origin of the Milky Way, a commonly accepted model still does not exist. 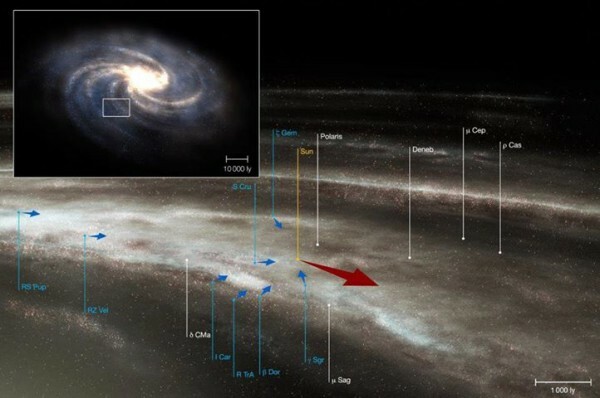 According to a first theory, proposed in 1962, the Milky Way apparently originated from the gravitational collapse of a rotating cloud of gas, consisting of hydrogen and helium. During the collapse, that took place in two stages, first the stars of the halo and the bulge were formed, and subsequently, from the gas residues of this process, enriched with the metals produced during the evolution of the larger first-generation stars, the disk originated, and in it, subsequently, the second generation stars were formed. However this model is in contrast with much observational evidence, for example the age of the globular clusters in the halo is not homogeneous; in particular, the identification of a population of intermediate-age objects in the thick disk, makes us think that the formation of the first generation stars did not take place in a short interval of time, as foreseen by the theory, but over a period of some billions of years. Furthermore a retrograde rotation is observed ( i.e. in the direction opposite to the Galaxy) for many globular clusters, which cannot be explained with the collapse of a cloud of gas. Other models indicate that the Milky Way did not originate from the collapse of a single cloud, however these do not solve any of the doubts. Gaia will perhaps be able to provide an answer to a number of questions. For the first time it will measure the individual chemical and dynamic characteristics of the stars of various galactic structures (disk, halo and bulge) up to approximately 33,000 light years from the Sun, and in this way it will provide a detailed assessment of the theoretical models of the dynamic and chemical evolution of the galaxies. Gaia will chart an enormous multidimensional celestial map that will guide us, very precisely, in most of the Milky Way. In fact the satellite will be able to extend its galactic horizon up to the centre of the Milky Way, and study the two main spiral arms – the Carina-Sagittarius arm (in the inner Milky Way) and the Perseus arm (in the outer Milky Way) (watch the video). In this way it will be possible to obtain information regarding the effective temperature, gravity on the surface and the metallicity of the stars of the Galactic disc and halo. The extreme precision that characterizes Gaia will enable the largest research of extrasolar planets ever carried out to date, with a sensitivity that can detect rocky planets the size of Neptune. The approach used by Gaia for the research and characterization of extrasolar planets is innovative. Unlike studies carried out till date, which bear in mind age, type of star around which it is believed the planets are orbiting, an astrometric census to search any “suns” with a planetary system is much more powerful, as it does not consider the age and chemical composition of the stars and does not depend on the orientation of the star system which, instead, can be determining in methods like transit. Gaia will collect an enormous amount of data, 1 Petabyte, i.e. 250 byte! All this data will converge into what will become a reference catalogue for all astronomers and which will include at least 500,000 distant quasars that will be observed optically for the first time. In order to give you an idea of the size of the work, with a normal computer it would take 300 years to analyze all that data. The European scientific community has created a Consortium (DPAC), which is dedicated specifically to elaborating and analyzing the data obtained by Gaia, where over 400 scientists from 22 European countries will participate. Italy, and more specifically the Astrophysics Observatory in Turin (Osservatorio Astrofisico di Torino), is the Italian national leader of this mission.